Since 2011, our collection now holds more than 20,000, catalogued specimens placing it third among the top parasite collections. The largest collection remains the US National Parasite Collection, now managed by the Smithsonian Institute and the second largest is at the Manter Laboratory of Parasitology. 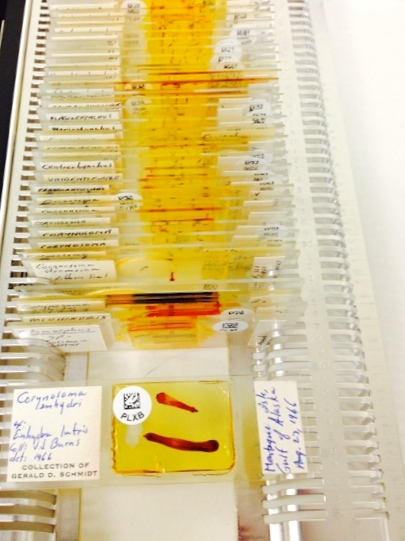 The MSB collection contains specimens stored in ethanol, mounted on slides, and on SEM stubs. Specimens at MSB are managed within the ARCTOS system, a database that integrates specimens, scientific results, and extensive collection-management tools to facilitate the use of biological collections. ARCTOS integrates with BerkeleyMapper, GenBank, and GoogleEarth. The Division of Parasites is the first collection to fully integrate with other divisions by directly linking the host records to the parasite records, adding to the integration with other specimen databases, such as GenBank. Sevilleta Long Term Ecological Research Station Mammal Parasite Collection (1989-1998). 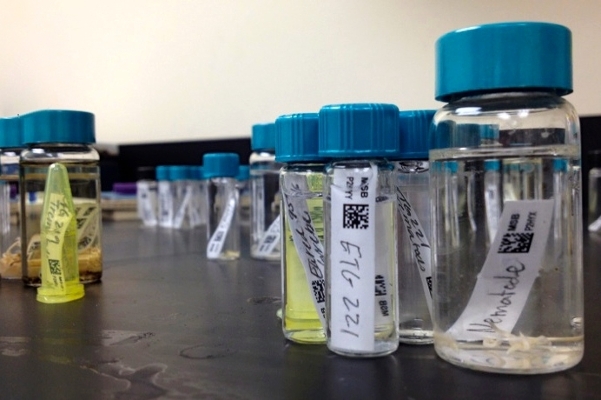 Integrated biological collections and informatics resources provide the foundation for documenting and understanding diversity. An integrated infrastructure joining specimens, information and research is a critical cornerstone in addressing broader challenges to biodiversity and sustainability. The MSB has become a primary resource for biodiversity informatics with a powerful presence on the internet that is fostering the development of integrated resources. Our largest integrated collection involves hosts and parasites from high latitude environments, where most of the parasites and many of the hosts are linked and here at MSB. 2011 – Present: Dr. Sam Loker becomes the first Curator of the Division of Parasites, with Dr. Sara Brant as the first senior Collections Manager. The foundation of the collection includes the lifetime Robert L. and Virginia R. Rausch Helminthological Collection, Sevilleta LTER small mammal parasite survey over 10 years, collection from the Global Nematomorpha survey and the collection of schistosomes from the career of Dr. Loker and the collaboration with Sara Brant on the Global schistosome diversity. The core of the newly formed Division of Parasites is graced with the impressive lifetime collection of Dr. Robert L. and Mrs. Virginia R. Rausch. The Robert L. and Virginia R. Rausch Helminthological Collection: Robert L. Rausch held a research and supervisory position with the U.S. Public Health Service in the Zoonotic Disease Section of the Arctic Health Research Center. This research center was established to investigate health problems of northern indigenous people. Dr. Rausch first began work in Barrow, Alaska in March 1949, and shortly thereafter he made first contact with the Nunamiut at Anaktuvuk Pass. For 25 years, he served at Chief of the Zoonotic Disease Section and oversaw a team of as many as 25 individuals in four units: Virology, Bacteriology, Entomology, and Helminthic Infections. Investigations were focused on rabies, brucellosis, tularemia, arboviruses, cyctic echinococcosis, trichinosis, alveolar echinococcosis, diphyllobothriasis, and other human pathogens, and included remote field expeditions and studies in their laboratories located on the University of Alaska campus in Fairbanks. 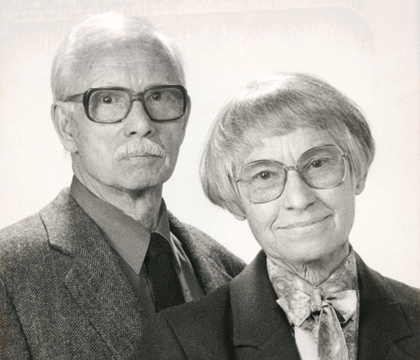 Virginia “Reggie” R. Sacressen joined the Zoonotic Disease Section in 1950 and she married Robert in 1953. Six years later, Francis H. Fay became part of the research team that was then active in field surveys of mammals aimed at isolating and identifying helminths and other parasites. Rausch’s team first defined the lifecycle of the cestodes responsible for alveolar echinococcosis in 1951-52, a devastating disease whose source had eluded investigators for more than 100 years (Eckert 2007). Their surveys of mammals on St. Lawrence Island indicated that arctic foxes (Vulpes lagopus) and root voles (Microtus oeconomus) were hosts. During the inventories of northern, western and central Alaska, they prepared a large number of museum specimens that resulted in a series of publications on the mammalian hosts (e.g., Rausch 1953a) and their associated nematode (e.g., Trichinella) and cestodes (e.g., Diphyllobothrium) parasites. After the Center closed in 1974, they continued work in Alaska, Siberia, and Canada. Dr. Rausch published about 300 papers in his distinguished career, many with a focus on Alaska’s fauna. He and Reggie built arguably the most significant museum collection available anywhere; a collection that integrates across both mammalian hosts and related parasites and provides ample opportunities for assessing changing environmental conditions at high latitudes. 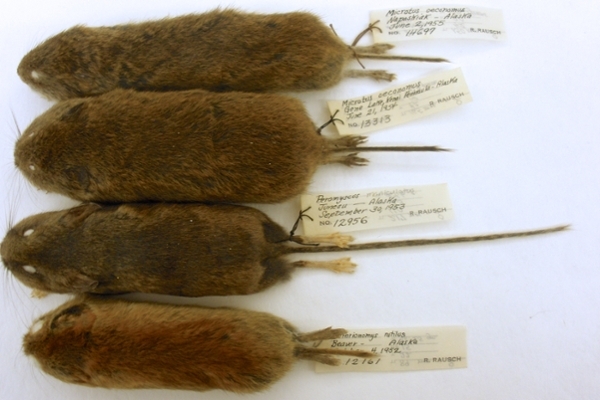 A premier example of the integrated collection concept is The Robert L. and Virginia R. Rausch collections that are part of both the Division of Parasitology and Division of Mammals at the Museum of Southwestern Biology. Bob and Reggie Rausch have donated a significant number of meticulously prepared specimens that they collected in over 55 years of fieldwork in remote sites principally in western North America (especially Alaska), Siberia, Mongolia, China, and elsewhere. More than 30,000 lots of parasites and 12,000 associated mammals from their work have been archived at MSB. These specimens form The Rausch’s have been at the forefront of integrating research on the systematics, taxonomy, biogeography, epidemiology, and pathology of helminth parasites in vertebrate hosts. Their work emphasizes the interface between parasitology, public health, and the occurrence and distribution of pathogens in wild mammals.